It's been a while since I've posted any personal photos ... I've decided to pretty much do away with the monthly "Hipstamatic" photos. I felt they were kind of disjointed and lacked any real relevance or narrative. The photo above is one I took recently. 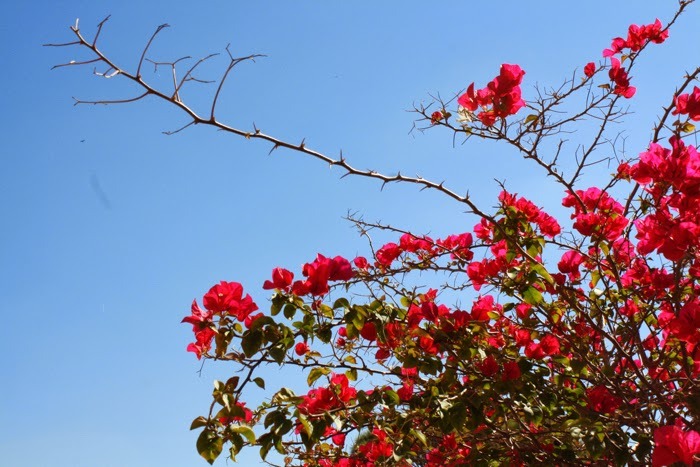 It's a bougainvillea tree, which is native to South America. The flowers come in a host of wonderfully vivid colors -- most commonly magenta-fuchsia-purple, but also red, gold, white, etc. These flowers remind me so much of the Mediterranean, of Spain and Greece -- especially Greece, where the contrast between the bright bougainvillea flowers against the stark white is almost blinding. But these bougainvillea trees and bushes also remind me of California, where Spanish-styled houses are common, and these bougainvilleas lace walkways belonging to Spanish missions. Though they may be common, they evoke a sense of optimism and hope in me. I recently revisited one of my favorite films from when I was a child, "The Secret Garden," and I think Mary said it best: "The secret garden is always open now. Open, and awake, and alive. If you look the right way, you can see that the whole world is a garden."